Do you already shop at Uniqlo? If not, put this Japan-based retailer on your go-to list right now. There are few places where you can get excellent quality for so little money. And, unlike so many affordable retailers, they are really great at minimalist basics. My closet is full of Uniqlo denim and cashmere. I love that place. The deals are even sweeter right now with many items marked down through Sunday. 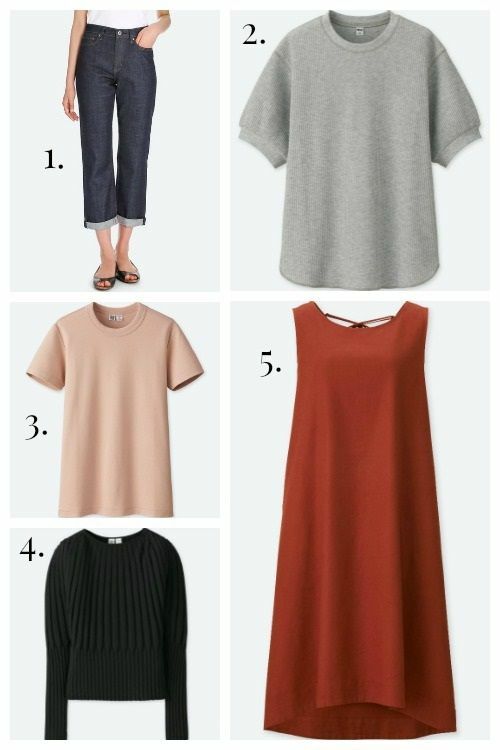 I’ve picked five minimalist-chic pieces that are building blocks for a smart summer wardrobe and are marked under twenty dollars each. Unbelievably, you can pick up all five items here for under $85.00, plus get free shipping! These updated jeans have the of-the-moment silhouette that is so popular right now: high-rise, cropped, straight-leg. I’m a big fan of Uniqlo denim. The quality you get for the price is amazing. I have over ten pair of Uniqlo jeans, and just snapped up these sale-priced jeans. They’re available in four washes, including white. A waffle knit gives this slouchy tee a unique look. It’s available in eight colors, from black, white, and grey to jewel-toned red and dark blue. This best-selling tee has a perfect five-star rating with nearly 70 reviews. Buyers praise the quality construction and soft texture, as well as the fact that the white version isn’t the least bit see-through. It’s available in eleven colors, including neutrals and beautifully sun-washed shades of pink, blue, and orange. Available in light gray, black, and yellow, this wide-ribbed sweater is part of the capsule collection produced under the watchful eye of knit guru Christophe Lemaire. The sale price is an exceptionally good deal. Summer staple linen gets updated with a minimalist design that looks straight out of Jil Sander, or, at the very least, COS. Which is to say, it vibes way more expensive than twenty bucks. It’s available in four colors.